With an extensive selection of signature cocktails there's room to choose--hand-muddled with fresh fruit and herbs, the strawberry basil martini can't be missed. I've had 2 good experiences! cuchi cuchi.. a place to skip. Fun restaurant with an eclectic menu. 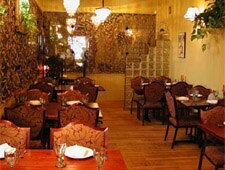 Great decor and the servers are generally nice and friendly. Food is good, but not spectacular. A bit expensive when you add up all the small plates.